The Tornado's Path - Part Six: "Iron Man"
The Red Tornado battles Solomon Grundy as the newly formed Justice League takes on the revamped and upgraded Amazo. Despite receiving a savage beating the Tornado refuses to give up, even after Grundy rips off his right arm at the elbow. 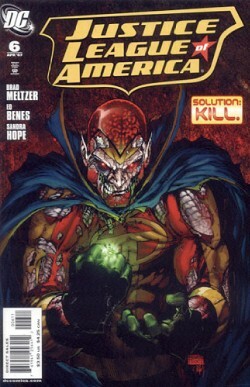 In the end both Grundy and Amazo are defeated but the Red Tornado is forced back into an android body. Story - 5: At the end of the first storyline that launched the renewed and reinvigorated JLA back in 1997 there was the feeling that the magnificent seven Justice League of America had returned. The heroes had fought against the White Martians and there were plenty of big budget moments that gave the entire enterprise a summer movie blockbuster feel. This was what the Justice League should be, many fans felt a new age of the League was born. Here we are a little over ten years later and the Justice League has been re-launched again. This time the first storyline took six issues (I don't count the zero issue as part of the arc) to get going and at the end we are given a very different feel. The Justice League is back and there was an epic fight, but instead of a popcorn movie feeling I'm left with the same sensations I had during the later episodes of Justice League Unlimited; amazed, excited and completely blown away. And sad. Really and truly sad because of what happened to the Red Tornado. In short, this was one of the best story arcs of the past ten years. Sure there were some hero moments in this chapter. Watching how Meltzer choreographed the League's battle with Amazo was just so good, especially with the narration. Meltzer has always been good with providing the audience with just enough to highlight what is needed when the artwork is doing the bulk of the work. This was a League committed to their job. No tough guy dialogue. No empty threats. They just went to town on Amazo and hit him with everything they had. Everyone had a chance to shine. Everyone got to play the hero and when you have characters like Red Arrow hanging out with Superman this is important to remind the audience that even the non-powered heroes are there for a reason. The heart of this issue (in fact the heart of the storyline in general) is the Red Tornado. His fight with Solomon Grundy was unlike anything I've ever seen in a Justice League story. It was vicious. It was violent. It was gory and it was unsettling, but it also showed the determination of a man who found what he had always wanted and was prepared to fight to the end to keep it. In the end he failed to hold on to his humanity. Grundy was too powerful and the set-up was against him from the beginning. But he tried and that was the emotional center of this story. Yeah we got to see the League reformed and there were great fights and nods to the entire history of the League but Meltzer also gave us a character to root for and in the end a character to feel for as his fondest wish is granted and then taken away. I mean I finished this book and literally sat back in astonishment. Even with the delays and hype this story delivered on every level. I will admit that at first I thought "That's it?" but as the totality of what happened sunk in I had the same thought but with the realization that even though there was a victory this wasn't a happy ending. This comic made me think. It made me feel. It had everything I like in a story and more. If this is how Meltzer is starting I can't wait to see what else he has in store. Art - 5: As Judge Mills Lane would say, "Let's get it on!" Benes and Hope handled the action in this issue beautifully. I hardly ever say this but if the delays on this book were because Ed and Sandra needed more time to get their work done than I have no problems whatsoever. The action was incredible. The facial expressions, especially those of Red Tornado and Solomon Grundy, were spectacular and the page layouts made the fan in me squeal in utter delight. I won't say that this is what Justice League art should look like because every incarnation has its own quirks, but this was exactly what Meltzer's writing needed to sell the emotion and excitement of the story. Two scenes deserve special recognition, the first being the two page spread of the Red Tornado and Amazo. I loved this. It came at just the right time and showed how these two characters were connected. The second, and more disturbing, was the cannibalism scene. Now you would think after watching a man get his arm wrenched out would be upsetting enough (especially the uneasiness I felt with the lead-in), but the fact that they shaded out Grundy's snack made it even more sinister. I wanted to make sure that this wasn't an issue of INFINITE CRISIS or 52, but no, this is JUSTICE LEAGUE OF AMERICA. This is an example where pulling back a bit can make the scene more powerful than showing the graphic amputation and then the graphic meal that followed. Cover Art A - 5: (Standard Cover by Michael Turner and Peter Steigerwald) Simple and intricate. This was a very powerful cover with a sinister looking Red Tornado staring out at the reader. I have nothing bad to say about this cover at all. Cover Art B - 5: (Alternate Cover by Adam Hughes) It's Adam Hughes drawing the Black Canary. What's not to like? No seriously, if you can tell me one thing that is bad about this cover and make a strong enough case then I will make a very public apology on this site. Until then I remain a fan of this cover. Not that I bought it, of course. Check out the Comic Index Lists for the complete list of Superman-related comics published in 2007.